If you are a dog person, you probably wonder what goes on in their doggy minds, right? Sometimes you can tell what they have to be thinking from the sheer joy they exhibit or the baleful glances they give you when you do something mean like take them to the vet or the groomer. But what about general, daily sorts of things; how do they feel about those? 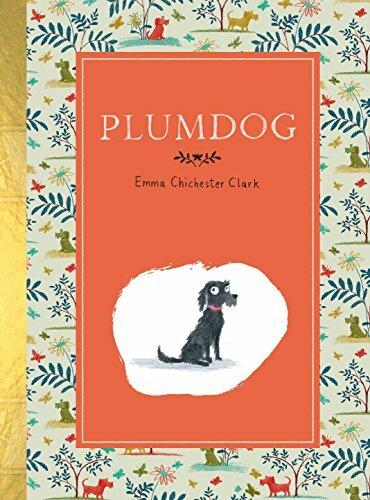 Readers are in luck because Emma Chichester Clark has written and illustrated a charming book about a year in the life of her dog Plum, entirely from Plum's perspective, and it will confirm all the happy, funny things you've always thought your dog was thinking. Plum is a Whoosell, a whippet, poodle, Jack Russell mix. She likes long walks, cavorting in any body of water, visiting her sister and other canine friends, going on adventures, and cuddling up with her human. She is completely delightful and funny and entertaining and friendly (except to rare not so nice dogs she come across in her ramblings). She shares snippets of her days as well as small insights into Emma's life. Opening with Plum's New Year Resolutions, which are "To be braver. [picture Plum on her back in a submissive pose between two bigger dogs] To catch a cat. To catch a fox. Not to unstuff my new toys immediately. To sleep in their bed every night" and ending on December 31 with "We went to stay with our friends in the country for New Year's Eve. It was just as comfy as I remembered. The chairs and sofas are for dogs, unlike in our house. While everyone was watching TV I thought about the resolutions I'd made at the beginning of the year, and I realised I had almost 100% failed--except for one thing: the middle of their bed is MINE," the book isn't really a narrative per se, but a delightfully illustrated diary chronicling small, sweet snapshots of the previous year. It's a heart warming love letter to a dog, the joy in her heart and the joy she brings Clark. And reading it will bring the same kind of uncomplicated joy to anyone lucky enough to live with a dog.